Toward the end of Thor: Ragnarok, Thor and his "Revengers" battle Hela in what might be the best Marvel fight scene to date. The bulk of the long battle sequence is set to Led Zeppelin's iconic "Immigrant Song," and fans of the film are justifiably in love with the scene. One person is not in love with it, however. Jack Black has a bone to pick with the movie. Black posted a video on Instagram calling out Hemsworth and Thor. "You know in School Of Rock when I sing a part of that monstrous Led Zeppelin jam 'Immigrant Song,' and it’s super bitching, and like the raddest part of the movie?" Black says. "Well, it’s come to my attention that someone kind of stole that chunk of our movie and put it in their movie. That’s right. I’m talking about Thor: Ragnarok." Black proceeds to challenge Hemsworth to a "battle of the jams," which isn't a thing. It maybe has something to do with fancy fingernails. He even hammered (salt in Thor's wound, no doubt) the point home further by posting a video from the set of his new film The House With A Clock In Its Walls. In it, Black dance fights in slow motion with his Clock co-star Cate Blanchett. She plays Thor's evil sister Hela in Ragnarok. Black laid the challenge Thursday. 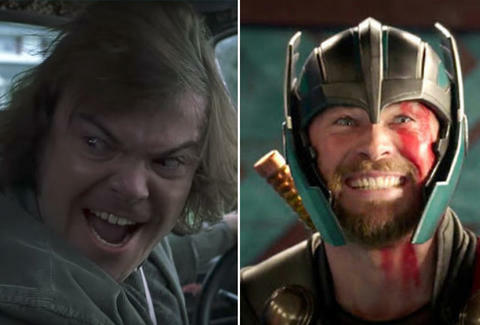 On Saturday, after Thor director Taika Waititi reposted Black's challenge, Hemsworth responded and accepted the challenge to a battle of preserves. "So yeah, let’s do it. Whatever. My place or yours, baby. I’m in," he says. None of it makes any sense, but that's okay. If it produces another fight set to "Immigrant Song" this tiff will have served its purpose. Just imagine that time Jack Black got slapped in the face on The Price Is Right set to Zeppelin.